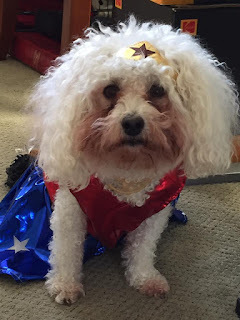 Killer Characters: Wonder Woman or What am I Doing in This Costume? Wonder Woman or What am I Doing in This Costume? So- Little dog here- you know the one who my human based Mal in the Mackinac Island Fudge Shop Series on. I promised you all a picture of me in my Halloween Costume. As you can see, We are not amused. At least I'm Wonder Woman - there are so many other costumes I could have been forced to wear. I was a chicken once, but my all time favorite costume was my mail man costume. I love going out with my human to get the mail. Sometimes she gets books and then we get to sit in the big chair together and read. Mostly she spends time with the laptop, writing books. She is currently working on a new series with a cat in it. I used to live with two cats. Cats are very strange creatures. They don't like to play fetch and they hate costumes even more than I do. At least I got to go for walks. The cats never left the house as they didn't know how to walk themselves on a leash. I like to gather up my leash and walk myself. My human ensures I don't tangle with any cars and we stop and look both ways when we cross the street. Anyway- I like it when she starts work on a new book because she spends more time in the big chair and I get to sleep beside her. I don't know why she picked a cat and not a dog this time, but as long as I'm her number one pet all is well in my house. Did you dress up for Halloween? If so, I'd love to know who or what as I'm looking for inspiration for next year. Oh Ruff, poor bebe. Well, we used to have two doggies but they have both gone to the Rainbow Bridge. Our Zebra Finch, Opal and Topaz would not stand for costumes, although my spouse is a designer and has used their tailfeathers as embellishmets for shoes and designed a long scarf with their feathers' pictured.